Summary: Agnes Chindimba is the founder of Deaf Women Included—DWI—a nonpartisan organization that champions the lives of deaf people in Zimbabwe. Through DWI, Chindimba has organized training programs, mobilized resources for the deaf to start small businesses, and educated them to be able to register to vote. During this time, she and her colleagues have been harassed by local police who don’t want them recruiting voters. Profile: Life is not easy when you’re deaf. Agnes Chindimba certainly knows that; she’s been deaf since she was 14. But Chindimba sees her deafness more of a calling than a handicap; she advocates for other deaf people in Zimbabwe. And deaf people are particularly vulnerable around election time. 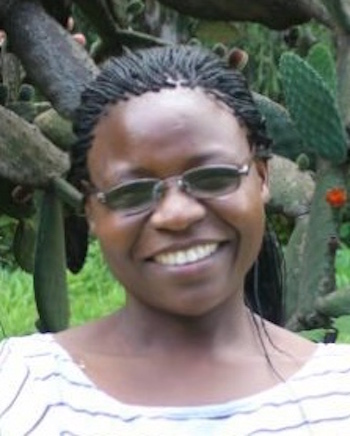 Everywhere she looked in the disabled community, Chindimba saw need. So in 2013, she founded Deaf Women Included—DWI. “We are a membership-based organization,” says Chindimba, “and so far I have helped establish a number of initiatives across the country.” It’s all in the name of inclusion—helping deaf people become a part of the larger community. Agnes Chindimba has become a sparkling example of triumph over adversity. Facing frequent misunderstanding and occasional hostility, she has put on training programs, collected money from donors to help deaf people start small businesses, and of course mobilized them to register to vote. She is deaf, and she is strong.